OPEN MIND Technologies AG, a leading developer of CAM/CAD-Software, will showcase the latest version of the hyperMILL® at CIMT, one of the four largest international machine tool expos in the world (China International Exhibition Center, Beijing, 17 - 22 April 2017). In Hall 8 of the German pavilion, the CAM specialists will demonstrate how to fully take advantage of NC machines. hyperMILL® is a modular complete CAM solution for 2.5D, 3D and 5axis milling and machining operations such as high-speed cutting (HSC) and high-performance cutting (HPC). Thanks to powerful CAM strategies, NC programs can be quickly and easily generated, even for complex components. Since all strategies are integrated in one interface, all milling and mill turning operations can be created with just one CAM software application. This enables integrated processes and minimised machining times, while also increasing reliability – for maximum process reliability, cost-effectiveness and quality. 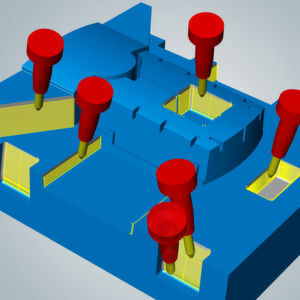 Manufacturing companies can maintain and increase their competitiveness with the innovative hyperMILL® CAM system. OPEN MIND has developed a special method for highly efficient finishing of steep and flat surfaces: 5axis tangent plane machining with conical barrel cutters. In practice, this method of machining results in time savings of 90 per cent and more. The finishing module with the 5axis tangential machining strategy represents yet another high-performance solution for machining all continuous faces. This strategy also uses the conical barrel cutter with its special geometry. This tool was developed by OPEN MIND and features exceptionally large radii. These enable milling with large path distances with the same theoretical scallop height. The result: high-quality surfaces with extremely short machining times and increased tool life. Both the roughing and drilling modules also offer equally high optimization potential. When using HPC machining with trochoidal tool movements, time savings can be 20 to 70 per cent greater than before.